Gripple suspension kits, comprise of lock, high-tensile wire rope and a choice of fixing attached to it. The kits are designed to enable quick and easy installation of a variety of mechanical, electrical and HVAC services. 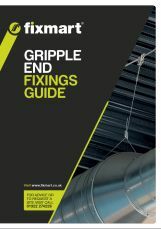 In our guide we focus on the various end fixings available and their many applications which help simplify and speed up the installation of building services. Our guide highlights the ideal use, dimensions and safe working load for each end fixing available. Please fill in this simple form to enable this download, once you have fill it out once you will be able to download any of our resoruces without re-entering your details. Opt in to receive exciting offers and news that we hope you'd like to hear about. Every now and then, we'd like to use the information you give us to send you product, services and news most relevant to you. You can of course, opt out of these communications at any time.